Hello there again Janet - when I posted on this thread earlier, I could have sworn that your post from yesterday wasn't there. I think it must have been delayed for some reason. Anyway, I hope that you didn't think I had ignored your message and to you for joining our wonderful pool of CTC ladies. It would be fantastic to have a good month for the team - what chance of another couple of boats? Thanks for the welcomes! I added my time (name wasn't in pulldown yesterday, but today it was) and we got an extra point for boat V . I will give it one more shot for a better time before month is out. I went a bit too strong in first interval and wore myself out. Also doing beg pete plan. How do times work for the boat total? Is it an average of the five times? Looking forward to more challenges. welcome Janet, great to see your first result ! Felton, you are really very close, i am sure you´ll beat my time on your 3rd go ! Hope some more will join the challenge...only 8 Days left ! How do times work for the boat total? Is it an average of the five times? I am way too competitive for my own good. Had to try the contest two days in a row. Took almost 45 seconds off my time from either better technique, better pacing, or a slightly higher drag factor (115). If I could improve by 45 seconds every day I might catch some of the guys by month end . Need to do my beg pete plan today, but I know I will give it at least one more shot to get in a higher boat before month end. Great motivation and fun. Sorry to see you're still behind Claudius and Felton, Max. For you offcourse, not for them. Good luck everyone in the last week. NB: just checked and saw I'm already back to boat 3. 18 seconds behind boat 2. Even if the month would last for another couple of weeks that would not possible for me. Yes very tough Fred and Max...and all other with a second or more go...we chose the right--it will hurt--challenge !!! Successfully moved up a boat . It about killed me though...almost went handle down a few times. Took another 30 sec or so off my time. Appreciate the images posted so I can tell about how I should pace myself even if I am way slower than you guys are. 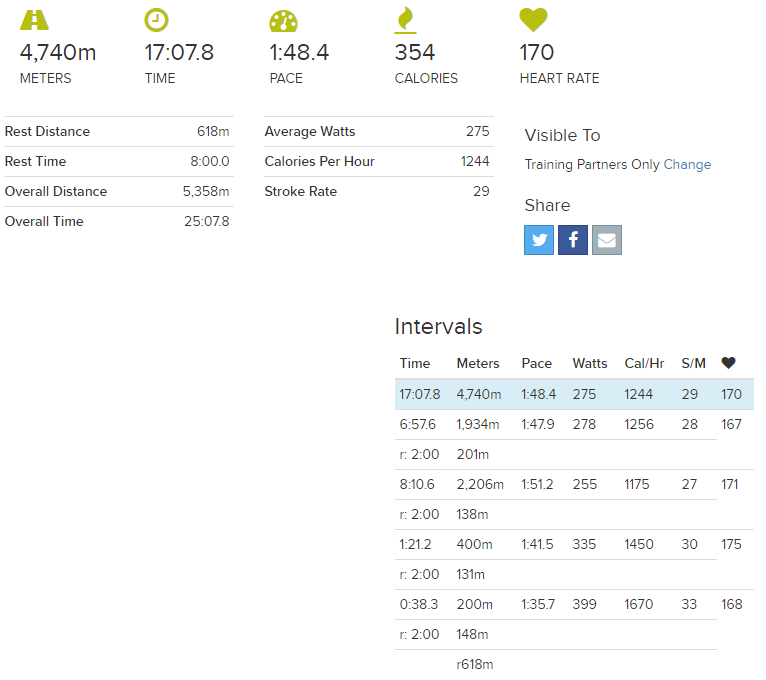 At least I am approaching the 2 min mark for short distances and I started a couple weeks ago at 2:40 pace, so I am sure I'll break that 2 min barrier before too long. 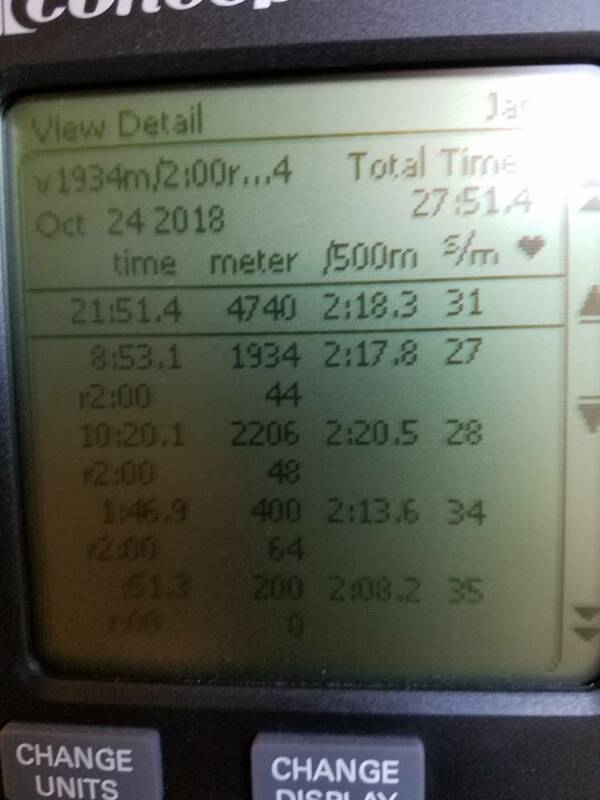 I haven't figured out how to post the camera shot, but I averaged 27-28 SPM the first 2 intervals and 34-35 the last two. Only 5ft4 so I tend to have a bit higher stroke rate than many, but let me know if I should alter that if I give it one last shot next week. Hopefully some ladies will lurk about the forum so I can better compare notes. Keep up the good work, team! 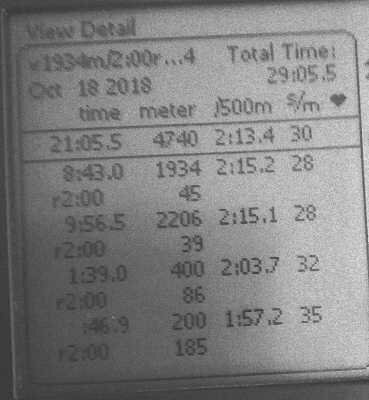 The attached image is from another lady rower to give you an idea on pacing - if you're a smart phone user, uploading images with tapatalk is straightforward. Janet, Great increase! In terms photos I think it depends on what device and apps people use. I use Erg Data on my android phone when I row and it syncs the sessions to my Concept2 log. Afterwards if I want to post an image I use a tablet to go into my logbook and take a screen image (a simple hand swipe across the screen). From Gallery I can then select the image and using "edit" and "transform" show just the rowing session rather than the full screen shot. It's pretty easy after the first time. Hope others share how they do it. Last edited by MaxMacLaren1 on Thu Oct 25, 2018 3:14 pm, edited 1 time in total. Just wanted to pop in to say hi. It's good to see such a high turnout for this month's CTC in honour of Gillian - notwithstanding the complicated nature of the challenge. Well done to Free Spirits for floating 8 boats! I've been doing practically no erging due to ongoing back problems, but put in a (very slow) time for Paddy Power today as I didn't want to miss out on taking part in this particular challenge. I'm really sorry to hear about the back. You have my sympathy - I am in a real battle with mine too, but it looks like it is finally on the mend. Sorry, I was looking at a previous challenge. But 5 is still very good and 8 might be a premonition! Despite something funky going on in my scapula since Friday I had a go at bumping Tako from boat II today (sorry Tako! ), but I came up just short. I lost the pace in the second interval. One more try on Wednesday I think. Hello there Paul - good to hear from you. I am sorry that you are still being plagued with back problems - be sensible and look after yourself. Best wishes and keep ' popping in ' when you can. Paul hope your back will be better soon, i guess you have a good Physiotherapist ! sorry for couldnt help you out - teledignosis have pitfalls ! Maybe we have 8 boats in the end of the month...made a bit advertising...but all the gymers and pharma sell-representatives said: ohh my god what for a long row session ! I have to admit for somebody not rowing regulary this is quite a long session ! Nevertheless a very good row Colin! Good luck for Wednesday! No problem, happy to provide a target! I already noticed your effort yesterday, as I am keeping my breath to see whether I will be kicked out. Jonathan seems to have stopped doing the C2CTC again, otherwise I would be in boat III already. Although the C2CTC this season is not a priority for me and I should take it a bit easy these days, I cannot help being competitive So on one hand I hope to stay in BOAT II, but I would also like more FreeSprits to do the challenge; especially to have Roger on the water. Maybe Sheena, the Underwoods and one more could help in a last minute effort??? ?